This view of the Sawyer House is from the 1880's. The viewpoint is to the northwest on the corner of 2nd Street and Myrtle Street. 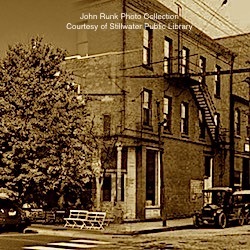 Photo credit, Mr. John Runk, courtesy of the Washington County Historical Society. To view a "Time-Tunnel" photo of this same location, just Click or Tap on the above photo. This will take you from 2016 to ca.1880's. Enjoy your hotel stay!